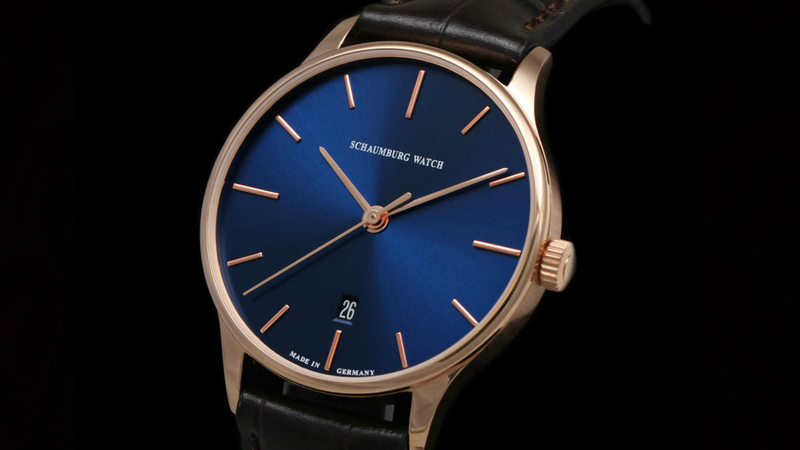 The Schaumburg Watch Classoco collection captures to perfection the very essence of the wristwatch. Elegant and refined in 18Kt rose gold, see the Classoco from Schaumburg Watch at Chronolux Fine Watches, authorised dealers. 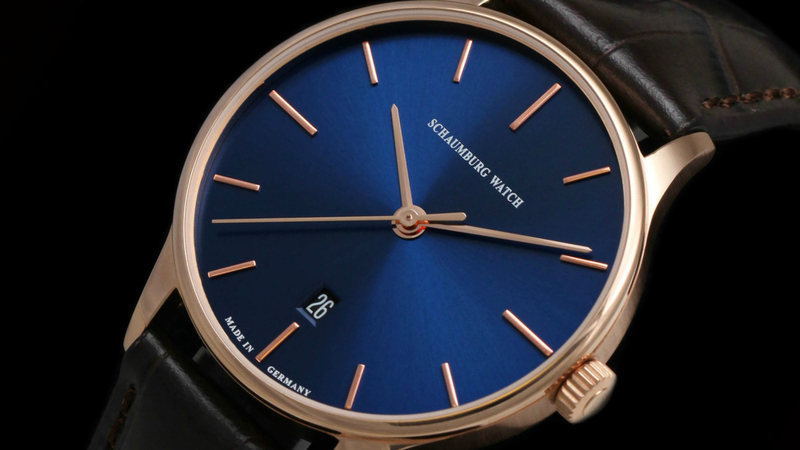 Schaumburg Watch Classoco automatic watch in 18Kt rose gold with blue dial and featuring transparent exhibition caseback on croco leather strap with 18Kt folding clasp from Chronolux Fine Watches, authorised dealer. Chronolux Fine Watches are very pleased to present the beautiful Classoco gents watch from Schaumburg Watch of Rinteln, Germany. Encased in 18Kt rose gold with polished and brushed surfacing, the Classoco's contours flow elegantly from lug tip to lug tip of its round 40mm case in distinguished classic style. Beneath the domed sapphire crystal the Classoco's sunburst blue dial, with slim gold baton hour markers and hands, appears demure and spatial. The clear but unobtrusive date window with inclined edging at the 6 the sole feature on an otherwise virgin surface. Inside beats the Schaumburg/Soprod manufacture SW11 automatic self winding movement, and its delightfully decorated rotor and plates are displayed through the transparent exhibition caseback. 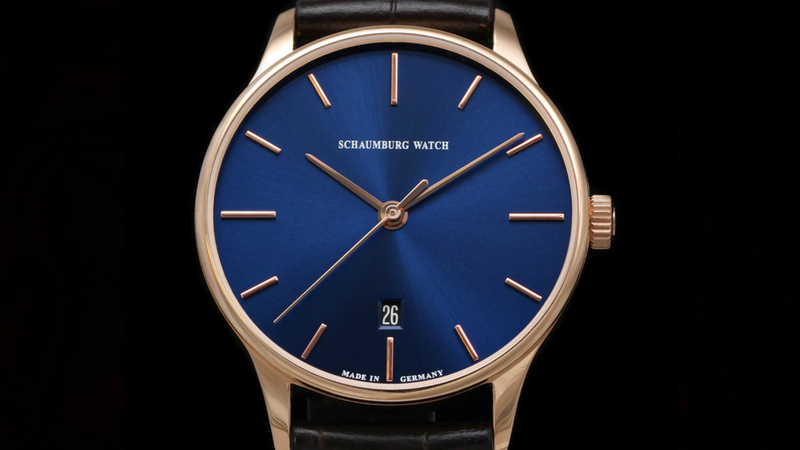 The Classoco represents a natural and important evolution of the Schaumburg Watch company's portfolio and makes a confident statement as the small company enters production in 18kt gold. It is beautifully appointed in typical teutonic fashion and finished to a superb level, each one manufactured in-house by hand. Suitably presented on a hand stitched crocodile leather strap with 18Kt rose gold folding deployant clasp, the Classoco really is a handsome and sophisticated wristwatch. Supplied complete with stamped warranty, direct from the Rinteln atelier, Chronolux Fine Watches are authorised dealer for Schaumburg Watch.